We still have a few openings available for this April Spring Turkey Season! Give us a call to check availability. Mention this Spring Turkey Special and receive $100 discount when you book a turkey hunt for March 18-21, 2019! Magnum Guide Service does a fantastic job. I have never been on a predator hunt like this before. 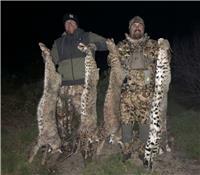 Our guide, Scott, was a workhorse and had us on cats & coyotes just about every hunt. We only didn’t see a coyote or cat one time in 3 days. I shot 2 boars, 4 cats and a javelina. It was a trip of lifetime with non-stop action. The food was incredible, by far the best I have ever had at any lodge. I want to thank them very much and I highly recommend this hunt to anyone who is serious about predator hunting! 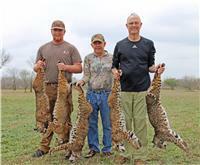 We just finished up our predator hunt at the ranch near Laredo, TX. We were hoping to get a bobcat and got five! It was a great experience. Jaime, our guide, did a great job calling the cats in and we had plenty of opportunity. 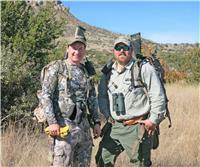 My hunting partner, Bill, and I got into the javelina the first days we were here which was no problem whatsoever. Jim, Melony and everyone were great! We had great food, great atmosphere, and a great lodge. The lodge was very nice and comfortable. We were just happy to be there. This was our second trip with Magnum. The first time we came down for spring turkey. This experience was equally as fun and just as rewarding. We’re really looking forward to the next one. I’m sure anyone would really enjoy this type of hunting! 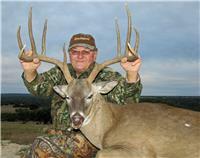 San Angelo Area "Fair Chase" Whitetail Hunts! We have availability this Nov-Jan for some affordable fair chase whitetail hunting for bucks in the upper 130’s to high 150’s B&C on a no-kill, no-pay trophy fee basis! These hunts are conducted out of our very comfortable “Main Lodge” and include Magnum Mel’s famous cuisine. 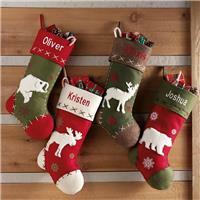 Hunters will have their own personal guide who will transport them to any of 4 ranches just minutes away. Call today to book your next adventure! (325) 853-1555 Lodge or (512) 517-0871 Jim’s Cell. New Mexico Pronghorn Antelope Hunt! If you are still looking for a spring turkey hunt give us a call!